T-Mobile's Magenta Friday deals are already live on the carrier's website, but these aren't the only special offers customers can grab this weekend. The Apple Watch Series 3 and 4 are on sale as well, although you'll to buy two pieces to get any advantages. On the bright side, if you buy the Apple Watch Series 3 (38mm, 42mm) or the Apple Watch Series 4 (40mm, 44mm), you'll get a $200 discount on the second one. The catch is that you'll have to add a DIGITS line as well. But that's not all. Today, the Apple Watch Series 3 38mm is available for $0 down and $15.84 per month for 24 months, while the Apple Watch Series 3 42mm sells for $0 down and $17.09 per month for 24 months. The Apple Watch Series 4 40mm costs $0 down and $20.84 per month for 24 months, whereas the Apple Watch Series 4 44mm is $221.00 down and $22 per month for 24 months. 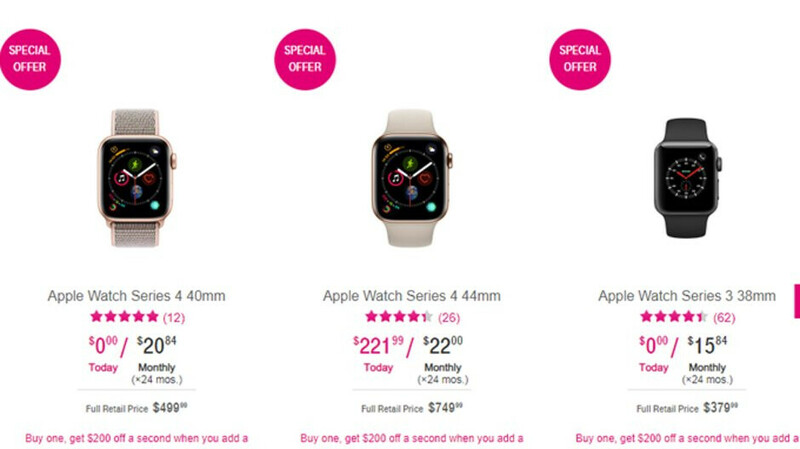 You'll have to purchase both watches on the same account through T-Mobile's 24-month no interest EIP with 0% APR and activate them with a paid DIGITS Apple Watch line (at least one new line for existing customers).